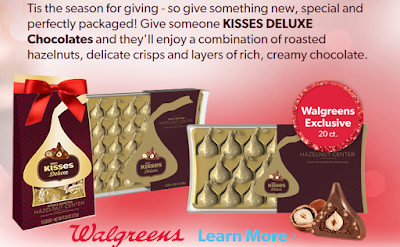 Savvy Spending: Walgreens: Exclusive Hershey's Kisses Deluxe 20 ct. packages= buy two, get 1000 points with your Walgreens Card! Walgreens: Exclusive Hershey's Kisses Deluxe 20 ct. packages= buy two, get 1000 points with your Walgreens Card! You can pick up 20-count Kisses Deluxe packages of Hershey's Kisses that are available exclusively at Walgreens! These Kisses offer a combination of roasted hazelnuts, delicate crisps and layers of rich, creamy chocolate. YUM! I love chocolate, and these make a great gift to take to a party and give to the hostess, to wrap up and surprise your neighbors with, or to leave for your mailman as a Christmas gift! Plus, you'll get 1000 points when you buy any two participating HERSHEY’S KISSES products with your Walgreens Balance Rewards card. Offer valid through 12/27/15. See store for details.